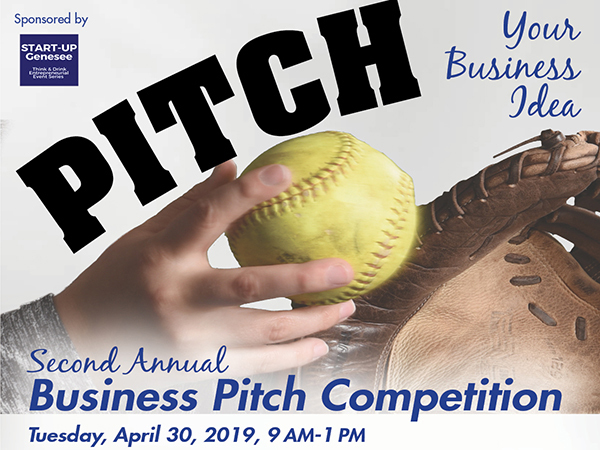 2nd Business Idea Pitch Competition April 30, 2019! Batavia, New York - Every second, three new businesses “startup” in the United States. In the time it takes the average reader to finish this paragraph, nine new companies will be born, according to the 2018 GEM (Global Entrepreneurship Monitor) national report. Conversely, the Small Business Administration tells us that 50% of those will fail during the first four to five years; but why is that? Do half of the entrepreneurs in the country have lousy ideas? Actually, among the leading causes for startup failure is a lack of basic business experience. In lieu of losing thousands of investment dollars, today’s entrepreneurs have found another way to gain that experience before launching their startup – education. “If you don’t educate yourself, you’ll never get out of the starting block because you’ll spend all your money making foolish decisions,” said Daymond John, investor on “Shark Tank,” a reality television show on ABC in which contestants pitch their business ideas to a panel of potential investors in hopes of launching their retail dreams. Genesee Community College offers both degree and certificate programs in Entrepreneurship to prepare emerging business owners and investors for success. To further open up learning opportunities to both students and the public, GCC teamed up with the GCEDC (Genesee County Economic Development Center) to sponsor the second annual Business Idea Pitch Competition. The competition will be held Tuesday, April 30, 2019 from 9 a.m. to 1 p.m. in room T102 of the Conable Technology Building at the Genesee Community College’s Batavia Campus. The deadline for competitors to register to participate is April 5, 2019. Registration requires the participant to submit an Executive Summary of their business idea, and attend at least one of the preparation workshops listed below. Participating high school students are not required to attend a workshop. The competition is limited to 25 participants who will be selected based on their Executive Summary submissions and announced on April 5, 2019. Executive Summary criteria and submission instructions are available by contacting Dr. Lina LaMattina at lmlamattina@genesee.edu. The GCEDC’s StartUp Genesee Networking Group has donated cash prizes which will be awarded at the Pitch Competition on April 30, 2019. Prizes of $100 for first place and $75 for second place will be awarded to the most outstanding competitors in the “most likely to succeed” and “most creative” categories. Pitches will be judged by local business leaders. To help participants pursue their passions and take their first entrepreneurial steps, GCC will host three preparation workshops. These workshops are free and open to anyone participating in the Business Idea Pitch Competition. To sign up for a workshop, please contact Dr. Lina LaMattina at lmlamattina@genesee.edu.